From reality TV to skateboarding vids, Keli Goff on the English bulldog’s path to stardom—and ubiquity. Thanks to a little fellow by the name of Banana Joe winning the Super Bowl of dogs, aka Westminster, the Affenpinscher will enjoy a couple of weeks as America’s most popular dog. But when the American Kennel Club recently announced its most popular dog breeds for 2012, the Affenpinscher was nowhere to be found. The usual suspects—family-friendly Labradors, golden retrievers, and beagles, and family-protecting German shepherds—all held on to the top spots. One surprise: the English bulldog finally waddled into the top five, a ranking it had not received in 75 years. So what has sparked the rise of the bulldog, increasingly the go-to breed of pet owners and marketers seeking to make a memorable impression on consumers? A variety of factors, “from pop culture to national security, influence the popularity” of breeds, said Lisa Peterson, a spokeswoman for the American Kennel Club. Dalmatians and other breeds have enjoyed significant sales spikes after a defining pop culture moment, such as the release and re-releases of the Disney classic 101 Dalmatians. The recent rise of the bulldog has been slow and steady, though, with the breed enjoying only sporadic moments of pop culture notoriety until recently. Spike the bulldog first appeared in Tom and Jerry cartoons in 1942. But the first bona-fide bulldog celebrity was Handsome Dan, the Yale University mascot, who holds the distinction of being the first live college mascot in the U.S. (Due to their perceived tenacity, the bulldog is one of the world’s most popular mascots, most notably representing its native England and the U.S. Marine Corps.) Handsome Dan landed the cover of Sports Illustrated in the 1950s, while rival Uga, of the University of Georgia, appeared on the cover in 1997, and a series of bulldogs became the stars of the memorable “Lucky Dog” ads for Purina throughout the 1980s. Still, it wasn’t until the 21st century that bulldogs really began to conquer America. 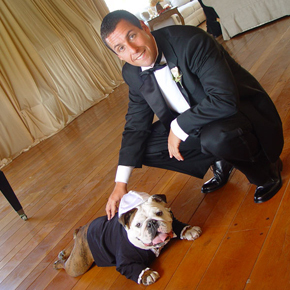 Adam Sandler featured a talking bulldog in his 2000 film Little Nicky, and while the film didn’t break box-office records, Sandler did help his furry costar, or at least the breed, break into the big time. Sandler’s real-life bulldog, Meatball, was rarely far from his side. The actor even had a custom-made tuxedo created so Meatball could participate in his wedding ceremony. “There have been an increased number of celebrities that own bulldogs, which contributed to their visibility” in recent years, said Peterson. The singers Pink, Joe Jonas, John Legend, Ashlee Simpson, and Miley Cyrus, as well as actors Brad Pitt and Ryan Phillippe, Olympian Michael Phelps, media personality Howard Stern and his wife, Beth, and other Hollywood notables became bulldog owners. In the paparazzi age, a photograph with Pitt or another A-lister can trigger demand, for better or worse, for a particular dog breed. With a price tag of nearly $5,000 among reputable breeders, bulldogs are considered by some as much of a status symbol as celebrity-endorsed designer duds. As the dogs’ cachet has grown, so has their presence on screen. Austin Anderson, who runs Hollywood Bulldogs, the breeder responsible for the bulldogs Meaty and Ms. Beefy from the MTV reality show Rob & Big, said he was inundated with nearly 500 requests for bulldogs that “looked just like Meaty—all white.” Cat Greenleaf said that since her English bulldog Gracie joined her on the set of her long-running entertainment talk show Talk Stoop in 2010, the dog has become so popular she receives her own fan mail. Perhaps even more influential than bulldogs’ star power in Hollywood is their star power enjoy online. If it weren’t for the Internet, bulldogs—like Justin Bieber—might not be the celebrities they are today. Tyson the English bulldog became one of the Internet age’s first pet celebrities, with videos of him skateboarding earning him stints on The Oprah Winfrey Show, not to mention his own Wikipedia page. He would pave the way for other online bulldog celebrities, among them Tillman, whose skateboarding video has more than 20 million views and who had a starring role on the first reality show for dogs on a major network, Greatest American Dog. (He also snowboards.) Beefy, not to be confused with Ms. Beefy of Rob & Big fame, also has become a successful skateboarding bulldog and part-time pet model. Marketers clearly have taken note. Countless brands have begun utilizing bulldogs, among them Iams, Jimmy Choo, PetSmart, Mini Cooper, Blue Basics dog food, Toyota, Volkswagen and Petco, all of whom made bulldogs key figures in high profile advertising campaigns. 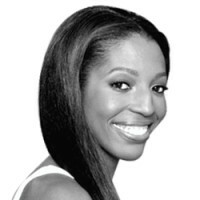 TV hostess and animal advocate Beth Stern, wife of shock jock Howard Stern, credited such advertisements with boosting bulldogs’ popularity. “Every time I turn on the TV, I see a bulldog in a commercial,” she said. The Sterns’ bulldog Bianca Romijn-Stamos Stern—yes, that was her real name—became a minor bulldog celebrity as a popular subject of discussion on Mr. Stern’s show and as the cover model for Mrs. Stern’s pet care book, Oh My Dog. But while she described the breed as “super cute” with “amazing charm,” Stern said she worries that bulldogs are in danger of becoming too popular. She expressed concern that the dogs would suffer the fate of other breeds that experienced rapid popularity growth, like Dalmatians. Demand could incentivize unscrupulous puppy mill owners to disregard health and safety, she said, leading to overbreeding that can cause health and temperament issues, ultimately landing more bulldogs in shelters.